Bought it on the G-Market! Shopping in Korea is fun. Little boutiques are as common as kimchi, and the brand name stores like H&M and Zara can keep a girl like me VERY happy. But what about Internet shopping? For me, a new mom who spends most of her time indoors (at least until the weather warms up a few degrees), Internet shopping has become a mainstay. Let me introduce you to my friend, G-Market. Founded in 2000 in Korea, it has become the country’s No. 1 Internet shopping website. And, believe me, you can find anything on there! When I see an article of clothing on the streets for W20,000, G-Market will often have it for cheaper. Shoes, too. And ever since I started shopping for baby, G-Market has become my mainstay baby supply center. I’ve bought a baby swing, a baby gym, a baby bouncer, clothes, cloth diapers, a baby crib and much much more. Make sure to click on English at the top of the screen. There will still be some Korean here and there but it will be much more navigable. Try searching for the item you are looking for rather than going through the broad categories. For example, when looking for baby items, I often start at Amazon.com and find the brand I like. Then I type that in the search at G-Market, and BAM. There it is. Register on the site. This is needed for you to easily order. In my experience, it has been next to impossible to register on the site through a Mac computer. So use your computer at work to register. Then you do do everything else through your Mac. To pay for an item, the easiest way is “from private account.” That way, you simply go to your ATM at your bank and send a wire transfer. Once you make the transfer, they will automatically send you a text message letting you know they received the money. You will receive another text when the item is shipped. G-Market is FAST. So expect it within a couple days! Thank you so much for posting this! 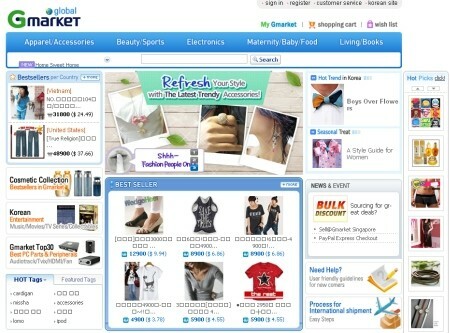 I've been wanting to shop online with G-market but with all the blinking changing images I just get too confused! Ah thats how you pay! For a year now I have been struggling to actually make any sort of payment with cards and all those options. Coz when you get to them that parts all in Korean. I'll give that “from private account” option a try. I agree with Sandra– I could not for the life of my figure out how to pay– we've been usuing a Mac this whole time. Now if only I can figure out the sizing for baby clothes!